The new findings run counter to the assumption that other factors are better indicators of whether a person is likely to have impaired cardiovascular health. Obesity raises the chance of heart attack regardless of whether a person has the cluster of cardiovascular risk factors known as metabolic syndrome, according to a study that challenges previous beliefs. Metabolic syndrome, a condition that includes high blood pressure, high cholesterol and high blood sugar, accounts for about 12 percent to 26 percent of the risk of heart attack and heart disease due to being overweight and obese, researchers found. The rest of the increased risk is mostly due to a person’s body mass index, according to Borge Nordestgaard, senior author of the study in JAMA Internal Medicine. 2007 Associated Press File A new study finds that people who were obese had more than double the risk of heart attack and a 64 percent increased risk of heart disease than someone who was normal weight. The findings counter previous assumptions that as long as a person didn’t have the risk factors of metabolic syndrome then being overweight was generally inconsequential to cardiovascular health. The study released Monday suggests that a person’s weight may provide a clearer picture of their heart health than other cardiovascular risk factors, the authors said. 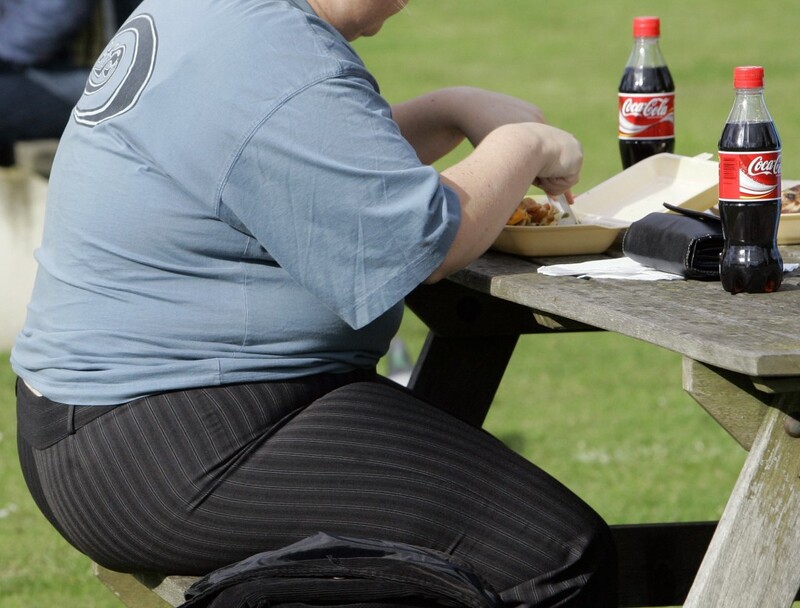 About 78 million U.S. adults are considered obese. The majority — more than 50 million — are non-Hispanic white, according to an October report from the National Center for Health Statistics, part of the U.S. Centers of Disease Control and Prevention. Obesity raises the risk of heart disease, diabetes, some cancers, osteoarthritis, sleep apnea and stroke, the CDC has said. Americans spend about $147 billion a year on obesity-related health costs. Obesity is measured using body mass index, or BMI, a calculation of weight and height. For example, a 5-foot, 4-inch woman weighing 175 pounds has a BMI of 30. BMI of 30 or more is considered obese, while a BMI of 25 to 29.9 is considered overweight, according to the National Institutes of Health. Researchers examined data from 71,527 people in a general population study. They found that metabolic syndrome was present in 10 percent of normal-weight people, 40 percent of overweight people and 62 percent of those who were obese, according to the paper. Those who were overweight had a 38 percent higher risk of having a heart attack and a 25 percent increased risk of having heart disease than someone who was normal weight. Those who were obese had more than double the risk of heart attack and a 64 percent increased risk of heart disease than someone who was normal weight, Nordestgaard said. He said while metabolic syndrome raised the likelihood of heart attack, the increased risk was because the person was overweight or obese. Still, previous research has raised questions about whether merely being overweight is a risk factor at all. In a January report from the CDC, researchers found that people who are overweight may have a lower risk of dying than those who are considered the ideal weight or who are severely obese. The study, which appeared in the Journal of the American Medical Association, was a review of 97 studies of more than 2.88 million people around the world. Chandra Jackson, who wrote an accompanying editorial along with Meir Stampfer, a professor of epidemiology and nutrition at Harvard School of Public Health, said the findings underscore the important of maintaining a healthy weight.